d. Coach teachers in and model design and implementation of technology-enhanced learning experiences emphasizing creativity, higher-order thinking skills and processes and mental habits of mind (e.g., critical thinking, metacognition and self-regulation) (ISTE 2011). A successful school technology program engages students in learning experiences that build skills in “critical thinking, metacognition, and self-regulation” (ISTE 2011). Technology coaches can support this effort by designing learning experiences that emphasize “creativity, higher-order thinking skills and processes and mental habits of mind” (ISTE 2011). Digital portfolios are powerful tools when they are used to create a larger audience for student work and to encourage student self-reflection on both individual pieces and entire bodies of work. The strength of digital portfolios is that they simplify the storage and sharing of student work. The potential is greater engagement and continuing conversation among teachers, parents, and students about the student’s work. Digital portfolios have the potential to create a stronger communication network among teachers, parents and students over the course of a student’s entire (K-12) school experience. As a Technology Integration Specialist, I had the opportunity to guide teachers and students in the use of digital portfolios when my school adopted the Seesaw student digital portfolio platform. Teachers used Seesaw to begin to build portfolios for students in Kindergarten. As students progress through grades K-8, they will learn how to add pieces to their own portfolios. Teachers will guide curation. Parents will be able to view and comment on their own child’s portfolio. Additionally, other teachers/community members (including other students) will be allowed to view and comment on a child’s portfolio. 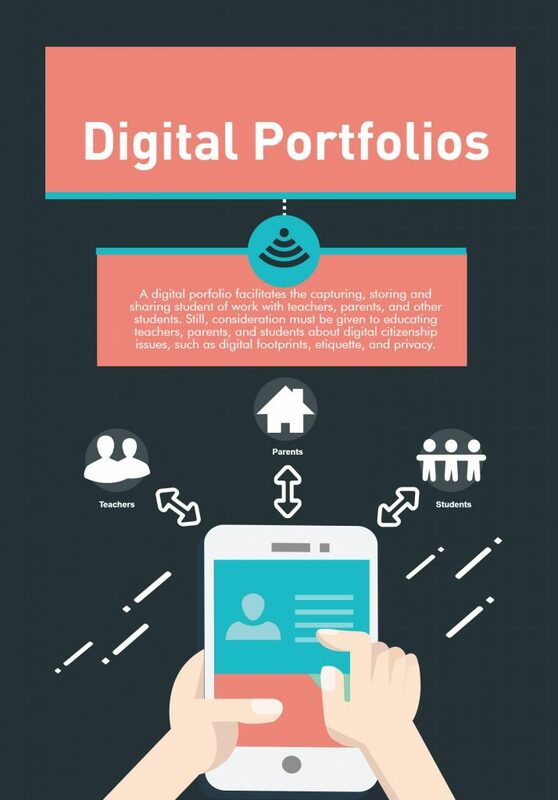 There are many technology tools that can be used to create digital portfolios. The most important thing coaches can do is to help teachers and students to learn how to use digital portfolio tools to curate learning artifacts, reflect on their learning experiences, share their work with a wide audience, and make plans for future learning endeavors. Technology coaches contribute to a technology-enhanced learning environment by creating opportunities for teachers and students to be creative, use higher-higher order thinking skills, and develop “processes and mental habits of mind” when using technology for learning (ISTE 2011).